Katie has experience in outpatient adult and pediatric settings, with a focus on social skills, sensory integration, feeding, and developmental and physical delays. 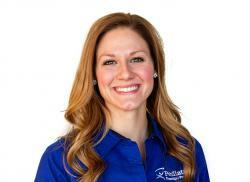 She holds a Master of Science in Occupational Therapy from the University of Mary in Bismarck. With a well-rounded background, Katie is passionate about working with children on feeding, self-regulation, and motor delays. She holds a certificate in SOS Feeding Approach.